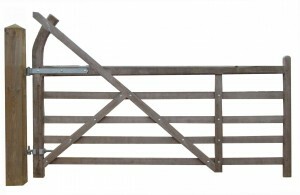 Turned Heel Entrance / Field Gate - Blamphayne Sawmills Ltd.
A traditionally designed gate. Fully Planed, with a curved and extended hanging stile. This gate certainly makes an impression! Top Rail is 4” x 3” and is tapered on the hardwood gate. Widths of up to 15’ are also possible. Available in Softwood or Hardwood.